Recently I heard a story about a man who made a choice regarding his career that was at odds with family expectations. He was roundly criticized by his father, some of his siblings, as well as an uncle. Much later, when the man started having financial problems, these relatives told him immediately that this was all his fault. According to them, his financial woes just had to be because of the career decision he had made. This is an example of what I refer to as clustering - family members ganging up on one of the members for breaking a family rule, and pressuring him or her to tow the party line. In an analogous fashion, some therapists inadvertently feed into a patient's problems rather than help remedy them, and in the process invalidate their own patients. Before getting to that, however, I wanted to mention that the man in question likened his relatives to "Job's Counselors." I of course had heard the story of Job, but I had never heard about that part. 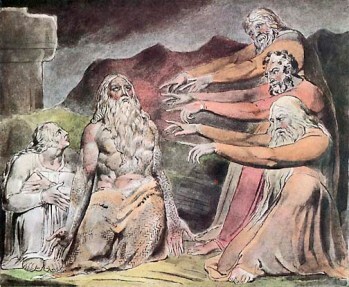 As most readers will know, the Book of Job in the Bible describes the tale of a pious and righteous man named Job, who had considerable wealth as well as wonderful sons and daughters. In heaven, God asks Satan for his opinion of Job's piety. Satan answers that Job is pious only because God has blessed him; if God were to take away everything that Job had, then he would surely curse God. God then gives Satan permission to take Job's wealth and kill all of his children and servants. Still, Job continues to praise God. Then, God allows Satan to afflict his body with boils; still he remains pious. Three of Job's friends became known as "Job's Counselors:" Eliphaz, Bildad, and Zophar. The friends tell Job that his suffering simply must be a punishment for sin, for God causes no one to suffer innocently. This of course, is the exact opposite of the truth as laid down in the story. So how does this relate to therapists inadvertently invalidating their patients? Well, many therapists focus on alleged defects in their patients and work on such things as "anger management," "distress tolerance skills," or fixing the patient's defective "mentalization" (the ability to accurately assess the intentions of other people). These sorts of interventions presume that if someone is upset, angry, or unhappy with the way the world is treating them, then therefore there must be something wrong with them. Even when they are in fact being abused horribly! Now, in defense of therapists who received reductionistic training, it is true that patients often act as if there is something wrong with them in these sorts of areas. However, as I have discussed in previous posts, there is a big difference in patients' public performance at a task as opposed to what they are capable of doing. Often the alleged defects are in reality part of one of the dysfunctional family roles frequently described in this blog. People who are exclusively trained in CBT do not know about —or if they do they do not accept—the concept of a persona or false self. CBT made a name for itself by attacking psychoanalysis, its predecessor as the predominant form of therapy, and rejected all of its concepts regardless of whether they were right or wrong. Researchers in personality disorders routinely make this same logical error all the time in studies. They look at the subjects' reactions without looking at all at what they are reacting to! It is a bit like watching a movie in which all but one of the characters - both their behavior and their verbalizations - are redacted so that the viewer can only see what one character is doing and saying, apparently in a vacuum. And then asking the viewer to guess why the one remaining character talks and acts the way he does. An excellent example of precisely this appeared in the February 2016 issue of the Journal of Personality Disorders - a study called "Using Negative Emotions to Trace the Experience of Borderline Personality Pathology" by M. Law and others. Research subjects were asked to record their emotions (especially irritability, anger, shame and guilt) five times a day for two weeks, but not the environmental triggers which seemed to create these feelings. The authors came to the shocking conclusion that the subject's BPD symptoms and their negative emotions were intricately related. No sh*t, Sherlock. Wouldn't it have been just a little more informative to have gotten data that would help us understand what sorts of situations were most likely to trigger both the negative emotions and the symptoms of people with borderline traits? Ya think? I think some therapists are open to deeper perspectives but have given up because clients are the ones who request treatment for negative mood states (devoid of context); they (the therapists) are just desperate to acquire and keep clients. Absolutely true. People just don't want to look at their families - one of the reasons is mentioned at the end of the masthead description of the blog. They want quick symptom relief. What do you suggest for someone who is more than willing to talk about their family, but the therapist tells you to "create and maintain boundaries"? I felt like saying, I DID create and maintain a boundary, that's the exact problem...the family members HATED it and they are all telling me to either change back to the easygoing pushover I always played, or I am to be scapegoated! Or what about a second therapist who told me that I should deal with my feelings of jealousy towards my golden child sister in law, as I play the shunned family scapegoat for no reason. When implied that I might be jealous of her, I said yes, of course I'm jealous! I'm jealous that I am not welcome to holidays unless I accept abuse from the family avenger, as he walks around scot-free and the golden child's every breathe is applauded! Those particular therapists made me feel even more invalidated than I already was, which caused me a lot of mental anguish, as I trusted them as "professionals". Can't seem to find a family therapist that really gets it, so I rely on your blogs for guidance, insight and my sanity amidst this sheer craziness! Tough to say from your post, it can be incredibly frustrating when therapists seem to take the wrong side in things, it sounds like you're in a no-win situation with your family, maybe you need to define a little better exactly what it is you're looking for in a therapist (maybe you have and just didn't include it here)? If you've defined your perspective it can help when "interviewing" potential therapists to screen out the ones that don't seem to get it upfront, saving time money and potential emotional anguish. Unfortunately, a lot of therapists do not know the strategies for extricating patients from the type of roles and double binds you describe yourself as having been thrust into - without cutting everyone involved off in the process. The types of therapists I recommend are listed near the the end of my post http://www.psychologytoday.com/blog/matter-personality/201205/finding-good-psychotherapist. As Oliver points out, you can ask up front about what therapy schools a prospective therapist operates from, and even discuss with them your disatisfaction with prior therapists as you just did here. Oliver's suggestion of a Bowen family therapist is a good one, as most of the other types in my post are harder to find.